We spent 6 nights in this special city on the Yucatán Peninsula as we were feeling pretty tired and had some ‘time to kill’ before our flight to Cuba and as it was also Spring Break the other areas in the Peninsula were expensive and busy. Mérida seemed like a great place to stop and live ‘normally’ for a while. We stayed at Art Apart Hostel now called Siesta Fiesta which had a great kitchen, a lovely big swimming pool and was close to the heart of Mérida, it was also great value for money and fun. We still have very fond memories of this city and look back on it as one of the many highlights of our trip. 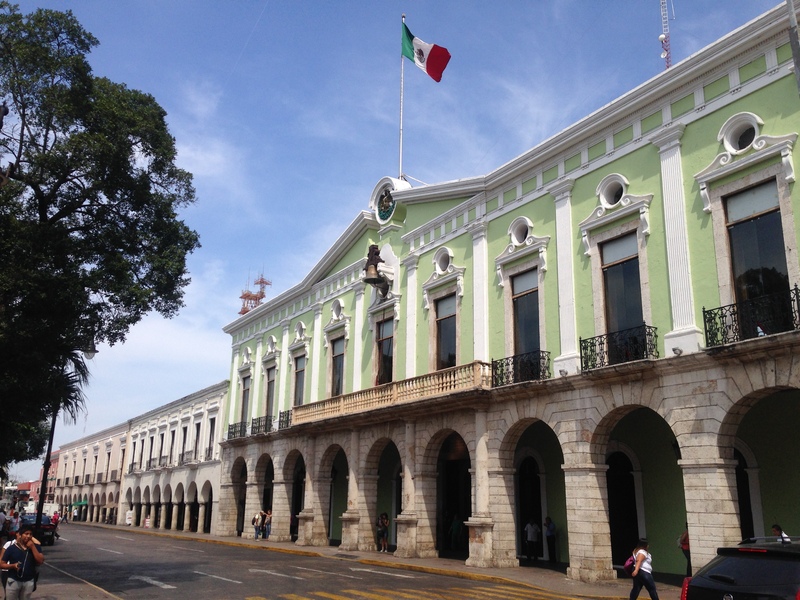 The charm and energy of Mérida comes from the cities lovely and large town square. It was so alive, with markets and events most nights of our stay. One special evening we watched a mariachi band, there must have been about 10 members of the group and the music was beautiful. They sang and played instruments and the local people loved it, they were up dancing and just enjoying the evening out. Mérida was one of the only places on the trip where we felt part of the city, we weren’t just another tourist. We had our local coffee shop, Bengala Kaffeehaus where we went every day for their amazing pour over coffee and air-conditioning. We took part in the towns events, shopped at the supermarkets and met local people. We went to the town square every evening and one evening in particular there were hundreds of couples dancing to a local band. We joined in and one lady in particular found our attempt at dancing hilarious, Ali has 2 left feet.. It was still a nice experience. Tip: Be careful of scammers that hang about the town square. They tend to try to attract tourists to expensive shops. As authentic as the stores look, do your research before buying. Every Sunday the city closes most of its main streets so locals can cycle. We rented some bikes along with hundreds of other people and cycled the city. There are beautiful avenues with old french inspired villas, lots of activities in the streets and squares. We even found a handmade shoe shop Tags alpargatas (Tags) run by some Mexican Hipsters. We ended up buying 4 pairs of shoes for only $24 NZD each. They were so cool with local designs and every purchase gives back to the local community. They even custom made Ali’s shoes as his feet were too big for all the store sizes. There was a Walmart really close to the hostel, I know it is not the best place in the world to shop as it is a huge corporation…. but the standard of this supermarket was very high compared to some others in Central America, we were like kids in a candy shop. We were able to get many home comforts such as salt and vinegar chips, popcorn and nice wine. They had lots of cheeses and fresh vegetables and an amazing in-store bakery. We were able to cook dinner for ourselves most nights which is something you miss when you have to eat out all the time as a traveller. From Mérida, it is a easy and short bus ride to Progreso, a small beach town on the Gulf of Mexico. Progreso was nothing special, the weather was not the greatest and compared to other beaches on the Peninsular it was not so impressive. We walked along the beach and had a nice lunch before returning back to Mérida. We loved the hostel we stayed in (Art Apart Hostel now called Siesta Fiesta Hostel). It was an old house that was split into 2 buildings due to a family dispute. They have converted old horse stables into rooms and there is art everywhere, it is like staying in a museum. The owners son even put on a free BBQ on our last night. We met other travellers as well as locals. It was nice learning more about the city as well as hearing some great stories from other peoples trips in the region. It was a great way to end our time in Mérida. Mérida is not a place to go to see specific tourist attractions, I don’t think we saw any, it is more the vibe that attracted us to this city. However, Mérida can be a base to go and see the Mayan ruin of chichen itza although we opted not to see it. Mérida seemed to us to be a very happy and safe city to explore and it was a much needed stop on our long trip. We hope you enjoy it too! Taking part in the Sunday morning cycling.